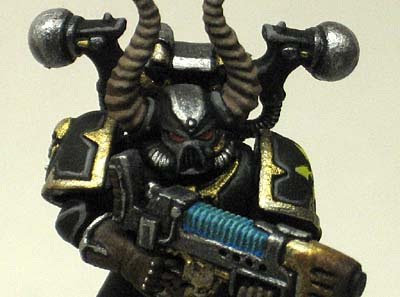 I got some great response from a post on Highlighting Black Armour when it was put up on Heresy Online. 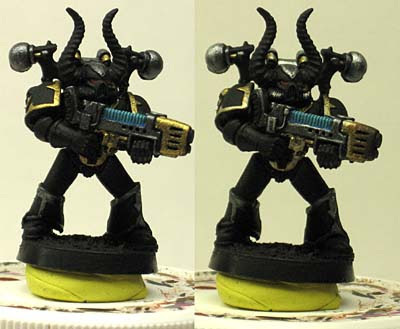 One of the guys there asked about highlighting black models with trim that was painted a different color (where you would normally put the highlight) like Black Legion Chaos Marines. quick tabletop standard on my new blog. It’s a good question and here’s what I would do. 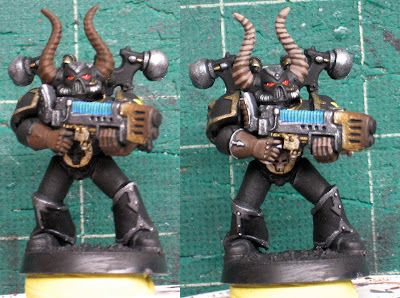 I decided to document the whole process of painting a space marine from start to finish but you can skip right to the highlighting part if you want to see how that’s done, it’s Step 9a for regular black armour and Step 9b for black armour with different colored trim. 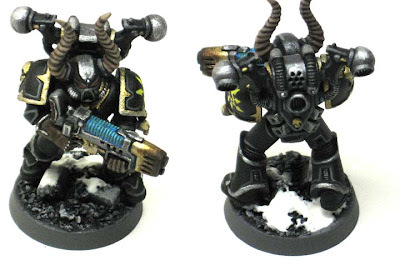 So here it is, from bits to tabletop… Black Legion. I get all my bits together and clean them up. It's an X-Acto knife and an old toothbrush to get them ready. I use cheap superglue to hold everything together. Once I’ve got him built, its time to base him. A little white glue, a dip in my basing material and then time to dry. Built and based, now its time to prime. Sometimes I’ll use spray paint to prime, but in this case, I just used a brush. If you notice the photo, my model is sitting on top of a paint jar. 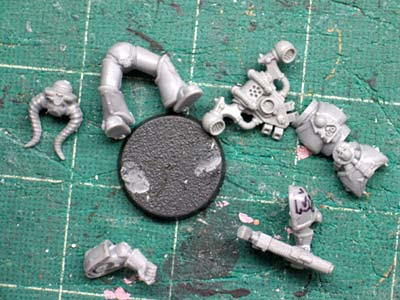 There’s a small blob of “blue-tac” or sticky type material to hold him in place. This really helps when it comes time to paint him as it keeps me from having to hold onto the mini directly while I’m trying to paint it. When I paint, I try to work from the “inside out.” Meaning I try to paint the areas that are hard to get to first and then go back and paint around those spots later on. Like painting the eyes and then the helmet, that way I can clean up my work as I go along. So, keeping that in mind, I dry brush the flex fitting around knees and joints and any other things like hoses and such now. I’m not worried about where I get any stray dry brush marks because I can go back and clean them up with some black paint as soon as I’m done dry brushing. The eyes and in this case, the plasma gun. I know it might seem out of order, but I paint the eyes now. This way I can paint them and then go back with black and cut in around them to clean them up. Now it’s time for the trim. Some parts were painted metal, some gold. After I had the base colors down, I used silver to highlight the metal parts and I added a little silver to the gold for it’s highlight. I also added the heat discoloration to the end of the plasma gun by adding some brown to the muzzle followed by a little black at the tip. Just like I would highlight something normally, I used the same approach here except I was using gold and silver. Really, the trick is breaking it down into manageable shapes. At this point, I thought I would get his gloves and horns out of the way. I didn’t do anything extravagant here, just a basecoat and a single highlight. I didn’t want too much contrast as I was trying to make this guy a little more subdued overall. Ok, the real reason for this whole thing. When it comes to highlighting black (or any color for that matter), I use 2 highlights because I think it has a nice end result. 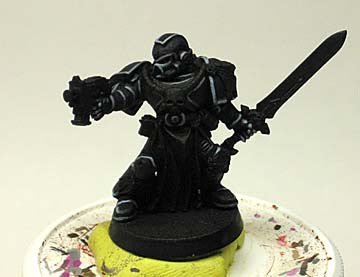 If you're just highlighting black armour, here's what I do. Prime and basecoat him black. The reason I basecoat him black after priming him black is so that when I go back to touch up any mistakes, the blacks match (sometimes pot paint and spray primers don't match exactly). Add the first highlight to the edges you want. I do the majority of the hard edges on the model. Add the second highlight to only the uppermost edges. I'll only pick out the high spots on the model for this highlight. After you've got the highlights you want, you can go back and clean up the edges and really sharpen up the look of your highlights by taking your basecoat and going back around the edges of your highlights. This will give the model a real "finished" look when you're done. The top half of the photo is before cleanup, the bottom half is after cleanup. In the case where the trim is gold or silver, it can be slightly different. Some people like high contrast, some like subdued… pick your colors as you see fit but the process remains the same. I highlight certain areas only because I like the end result, where you choose to add or leave out your highlights will ultimately be a choice you make based on what looks good to you. The photo above shows the front and back of our hero with the first highlight on him… so lets start at the top and work down. + The helmet: Straightforward highlighting like any other helmet. + The backpack: I’ll pick out edges on the very top and the back facing… only the parts you can see at a quick glance. + The shoulder pads: I’ll add a highlight on the upper facing (usually the front of the shoulder pad) right inside the trim at the front corner. Nothing on the back part usually. + The torso: If there is any part you can get to (and see) with his weapon where it is, I might add a highlight along the collar. 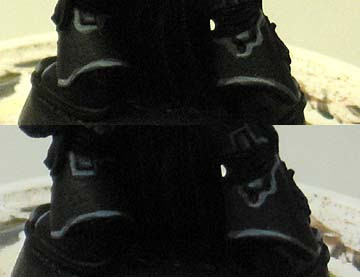 + The legs: With the top part of the leg armour not having any trim, I’ll highlight it like normal. Around the edges. 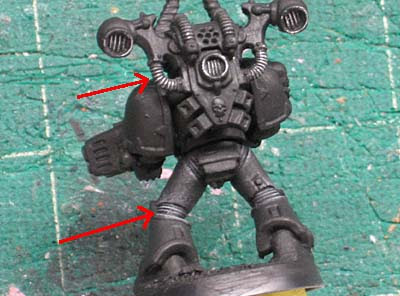 The lower portion of the legs has the silver trim so I only add a highlight around the lower trim piece (in this case he has some vertical cables embedded in his legs) and around the trim on any knees that are visible (his left knee on the front). + The feet: I’ll thrown a highlight on these for good measure and it is habit more than anything else. Sometimes it helps define any armour plates they have on their feet too. So here’s a close up of what his front looks like. At this point, both highlights have been added and cleaned up too. You can see where the highlight is on the shoulder pads in particular. The second highlight follows the first but doesn’t reach out as far from the corner of the shoulder pad like the first highlight does. And that’s it really, I ended up breaking him off the base I had him on originally and remounted him on this snow base I had lying around. Excellent tutorial. The model looks excellent as well. 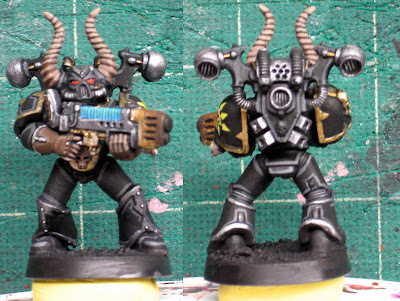 I know at some point I also want to do a Black Legion army - I shall keep this post in mind. Peter: Thanks. You can use any colors you want. It all depends on how extreme or subtle you want your highlights to be. As for the actual colors I used, they are just cheap paints from Michael's craft store... I don't even remember the names without going back to check. Great tutorial. I have a Black Legion army built and ready for primer. And now I know how to paint them! 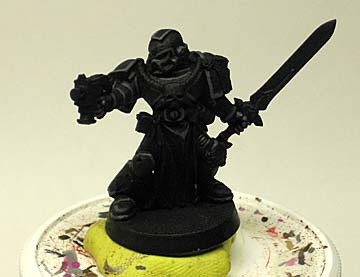 This is a great tutorial on painting black. Thanks much! Great tutorial, many thanks. 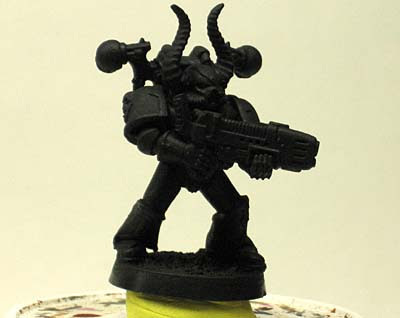 Just starting on some BL traitor terminators for Space Hulk. 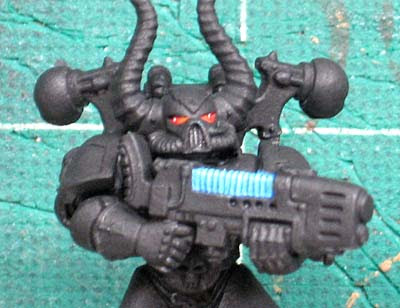 I have a question for painting damage on dark armour using the sponge technique - what colours work best for the damage and the higlighting? What are the options and does it look as effective on a black background? Tas: You can go straight to the metal, that's what I do. I'll dabble on some dark metallic silver (mainly around the edges only) and then to show really deep grooves or cuts, use a light grey and line highlight the underside of the individual scratch where the light would reflect on the edge of the paint that's been chipped away. And you don't even have to do the light grey part. But remember, less is more when it comes to battle damage. Thanks Ron - most appreciated! Have you got any examples where you have used this method? I used the same approach to some Raven Guard Scouts I did a while ago. It's a bit more refined and cleaned up, but the technique is the same. Thanks Ron - and thanks again for your time and effort in building the great resource that is FTW. No problem, glad it helps. 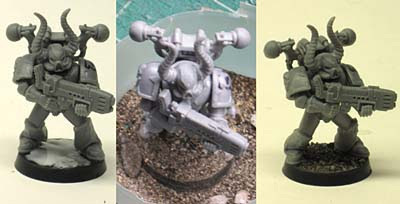 I've got a Techmarine I'm working on now that I'll be using this very approach on too.